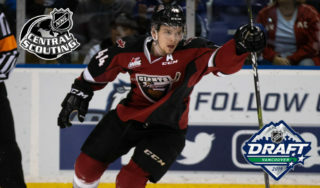 Saturday afternoon in Everett, WA the Vancouver Giants improved to 2-0 on the pre-season thanks to a 3-2 overtime victory over the Spokane Chiefs. 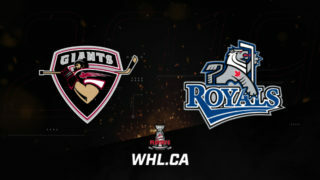 Brayden Watts scored the game-tying and game-winning goals for the Giants, the last of which came at 1:42 into overtime. Between the pipes Braedy Euerby played the full game for Vancouver and made 22 saves. 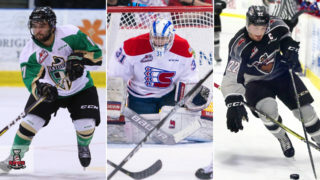 Jarret Anderson-Dolan and Carter Chorney responded with goals for Spokane who fall to 1-0-1-0 in the exhibition season. Through a scoreless first period the shots were 11-8 favoring the Chiefs. 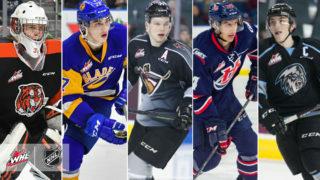 Spokane dressed a veteran-laden lineup that included Los Angeles Kings prospect Jarret Anderson-Dolan and 2018 New Jersey Devils first-rounder Ty Smith. Conversely the Giants dressed a younger lineup on Saturday that featured no 20-year-olds. Carter Chorney got Spokane on the board at 5:09 of the second period when he pounced on a Luke Gallagher rebound and tucked it past Braedy Euerby. Ty Smith also added an assist on Chorney’s third marker of the pre-season. Late in the middle period the Giants answered when rookie Lukas Svejkovsky won the race to an Owen Hardy rebound and wired it past Chiefs netminder Bailey Brkin. Vancouver’s power play finished the night one-for-five and is three-for-11 through two exhibition games. The penalty-kill went four-for-four. 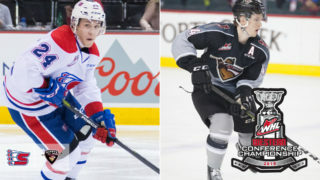 50 seconds later Jaret Anderson-Dolan restored Spokane’s lead when he snuck past the Giants defence, took a pass from Jeff Faith and beat Euerby with a backhand shot. The Chiefs took that 2-1 lead into the second intermission despite being outshot 26-20 by the Giants. Michael Dyck’s team came out strong in the third period. They outshot Spokane 8-3, and at 10:23 of the final frame they tied the game when Brayden Watts snuck a low shot past Brkin off a slick breakaway feed from Milos Roman. Bowen Byram added the second assist on Watts’ first goal of the night. No winner was decided through 60 minutes but Brayden Watts helped Vancouver complete their comeback at the 1:42 mark of overtime. Kaleb Bulych got the play started when he raced wide on the Chiefs defenceman along the right-wing and let a low shot go on Brkin. Brkin stopped the shot but kicked his rebound back in front of the net where Brayden Watts was waiting to snap it home. The final shots were 37-24 for the Giants. 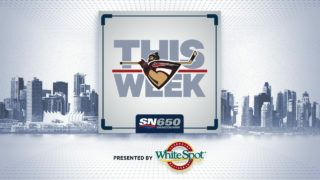 Up next for the Giants: The Tri-City Americans tomorrow morning at 11:30 AM. It will be the third game in a span of three days for both teams.